As part of the Sydney Fringe Comedy Festival, Luke Nowell brings to life a nonsensical physical comedy. Nowell’s one-man performance, pLight, showing at the Fusebox Theatre in Marrickville follows the great success of his previous entry into the 2014 Sydney Fringe Comedy Festival, The weaning of Life. It was definitely not what I was expecting- it was more. I think physical comedy can often be hit-and-miss, but pLight was a clear winner. There was something for everyone as he forced the audience out of their comfort zones into an entirely new space. This space relied heavily on the engagement of the audience and their willingness to suspend their disbelief. Through lighting and sound production, the audience travelled with Nowell to distant planets, socially awkward parties and blizzards. Nothing was left sacred as he explored the many facets of life in small, poignant and hilarious sketches. Nowell’s production is nothing less than Absurd. Having studied at French clown school, Ecole Philippe Gaulier, his physical theatre incorporates elements of pantomime, naivety, dramatic irony and he gives his everything to the performance. As with most absurdist theatre, it holds a magnifying glass over the follies and arbitrariness of the mundane. His performance pushes these to the extreme, eliciting a certain hysteria from the audience I was in- it was euphoric and most worked on the shock factor of the unexpected. It was a visceral experience that incorporated very simple elements of slapstick, and visual humour that is accessible to everyone, regardless of comedy-preference. His comic timing and attention to detail is impeccable as he embodies all of his personas down to his very toes. There are also running gags that perhaps seem a little redundant until an anti-climax which is just purely nonsense. I loved it, I had just a great night (and actually was a bit disappointed that it ended when it did). Nowell is very skilful at making his physical theatre seem effortless. It’s whimsical and light-hearted and a bit surreal at times- but definitely worth a watch. 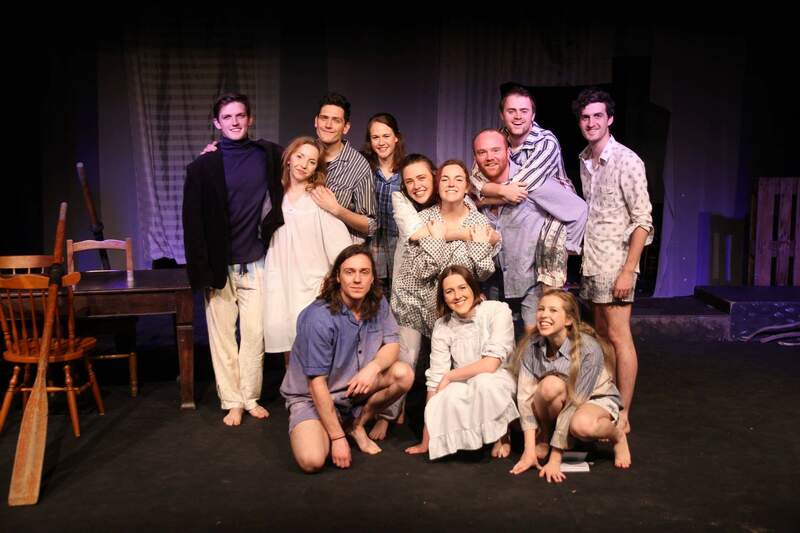 Tiny Horse Theatre, in association with Sydney University Dramatic Society, perform Under Milk Wood at the New Theatre, Newtown, during the Sydney Fringe Festival. It’s always very interesting to watch a production of Under Milk Wood, considering that this play, Dylan Thomas’ most famous of works, was intended to be performed as a radio drama. Visualising his poetry is a whole new experience, especially because Thomas’ poetry relies mostly on sound play, lyrical descriptions and the creation of atmosphere through words only. To begin at the beginning, this production of Under Milk Wood was exceptional. This play is one of my personal favourites, so while I may not be an unbiased writer, I am quite defensive of this play. I was very glad to see a production breathe life into Thomas’ poetry and do it justice. They used a mix of mediums which is of great credit to the production team. They opened with an audio recording of the opening lines and seamlessly integrated the recorded sound of poetry and the ocean, into the dialogue of the on-stage narrators. Throughout the play there were smooth transitions between the radio narration and performed narration, which was extremely effective and in fact added value to the play, creating a mystical fairy-tale aspect. They used silhouettes and lighting to change between time periods, scenes and characters- something that is very difficult to accomplish when attempting to distinguish between a dozen or so short vignettes in a small amount of time. The use of props was very innovative and effective, with oars, rocking chairs and tables all used interchangeably between scenes. They created an imagined space that was able to transport the audience into every nook and cranny of Llaregub, and into the homes and dreams of its residents, over the course of one day. The cast made use of the space, using only the most necessary props to signify the characters and their personalities. It was quite a collaborative effort, especially as there didn’t seem to be a ‘backstage’, only a preparatory space hidden behind curtains at the back, which was necessary for quick character changes, as well as the creation of soundscapes and choral pieces. I was most impressed with the strength of the cast. Thomas creates very eccentric, stylised characters with subtle depths and longings and, this cast was exceptional. With most cast members performing as multiple characters, I was in awe of how well they carried the integrity of the play, the dignity of their characters and remained unique to themselves. There was a live musician, solo pieces and stellar performances from unforgettable actors. I thoroughly enjoyed this production of Under Milk Wood.